Flash Super Retro Pong / Tennis. A rebrandable lo-fi game by Galaxy Graphics. Flash Games licensing. 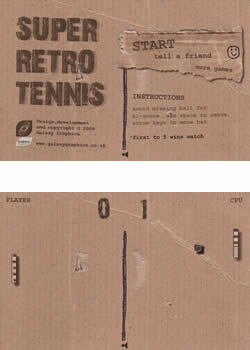 Super Retro Pong/Tennis: An arcade classic in Flash. One of the oldest and most familiar arcade games, Pong / Tennis is only about two bats and one ball - universally understood. This version of the game takes the old-school look of retro breakout another step further back with cardboard, home-made sound effects and smudged typewriter printing as it's lo-fi theme. Underneath the style there is of course the traditional Tennis game engine, recreated in Flash for web use. Looking for the Pong source code in actionscript? The source code for Pong is also available to buy from Galaxy Graphics. Click here to contact us about Pong source code.